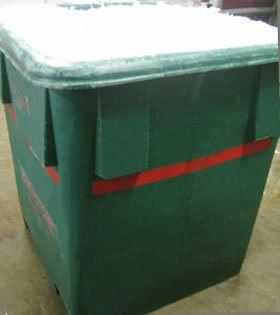 Salted Flake Ice is a bulk product designed for preserving meat, fish and other perishable goods in commercial quantities for industry. The salt content of the ice increases its longevity, and the larger surface area of the flakes makes it ideal for rapidly removing the latent heat from anything it comes in to contact with. The speed with which a perishable product such as fish can be brought close to zero degrees Celsius, and maintained at this temperature, has a dramatic effect on the shelf life of the product. 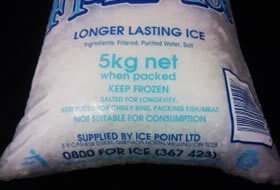 Ice Point can supply salted flake ice that is covered under our food safety programme and approved by the NZFSA. This product can be safely used in the food chain in the production of meat small goods, bread, or any other application where a food component needs to be chilled. We can supply in any volume. 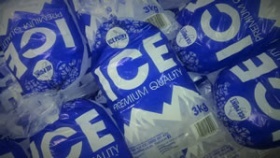 Ice Point can supply Salted Flake Ice in any volume up to several tonnes, and is ideal for meat processing, commercial fishing, and seafood retail operations. It is also finding new applications in fruit and vegetable packaging, poultry processing and in controlling the heat generated in concrete manufacturing. We have added this product to our range (pictured right). Ideal for recreational fishermen, chilli bins and packing fish/meat. This can be found in most good service stations and supermarkets in New Zealand.